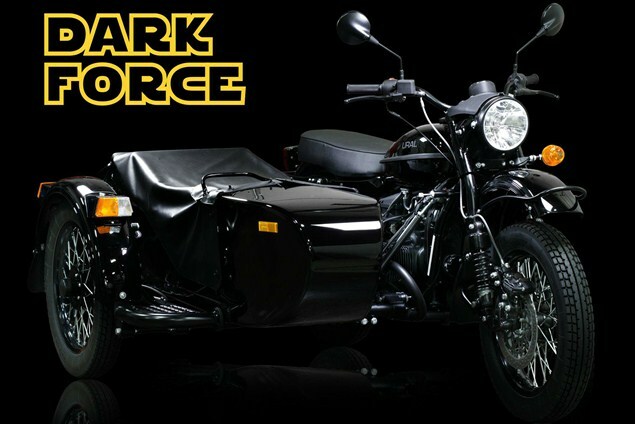 A LONG time ago in a galaxy far, far away, Darth Vader and the Emperor might have seemed less scary in this Star Wars-inspired Ural, complete with toy lightsaber. But never mind. The world is Star Wars mad at the moment, and that madness extends as far as the Ural Dark Force, an all-black version of the familiar three-seat, three-wheel creation, powered by a 41hp, 749cc air-cooled twin. Who says the Dark Side is more powerful? As well as the special paint scheme, the limited edition gets an LED headlight, a different seat and – yes – a toy lightsaber that clips to the side of the chair. Ural says of it: 'From a factory far, far away; nestled in the Ural Mountains, comes the Dark Force. Standard equipped with Lightsaber®, LED lighting, and fully blacked out to hide you in the shadows. 'Inspired by the world of Star Wars®, we created a motorcycle that lets your inner child explore the dark side with little damage to the real world balance of power. Come to the dark side...we've got sidecars! At the moment, the bike appears to only be on offer in the US, where just 25 will be sold at a price of $14,999.